“Gold Nugget Series” Manual This manual is to be used with the DVD Training Series The cost for one manual is $34.65 shipping included*. Service Professional Training Manual - ELECTRICAL This is the Manual that Dale uses in his Conferences and Classroom Trainings for Electrical Service Professionals. The cost for one manual is $41.65 shipping included*. 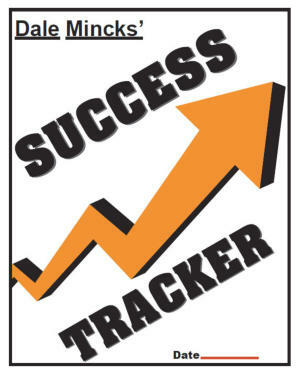 Dale Mincks’ The Success Tracker Make setting goals and measuring your success a breeze with the “New” Success Tracker! By knowing your numbers you control your future and success. The cost for one tracker is $26.65 shipping included*. The cost for five manuals is $153.65 shipping included*. The cost for 10 manuals is $273.65 shipping included*. Service Professional Training Manual - HVAC This is the Manual that Dale uses in his Conferences and Classroom Trainings for HVAC Service Professionals. The cost for one manual is $41.65 shipping included*. Service Professional Training Manual - PLUMBING This is the Manual that Dale uses in his Conferences and Classroom Trainings for Plumbing Service Professionals. The cost for one manual is $41.65 shipping included*. The cost for five trackers is $103.65 shipping included*. The cost for 10 trackers is $185.65 shipping included*. Dale also provides: • Phone Consultations • Live Web Trainings • On site Conferences & Trainings • Customized Training for You and Your Company • Individual In-Depth Training Email info@dalemincks.com for more information. The Success Tracker Make setting goals and measuring your success a breeze with the “New” Success Tracker! By knowing your numbers you control your future and success. The cost for one tracker is $26.65 shipping included*.